Although represented in our 28 April concert at St George’s by just a single short piece for harpsichord, Elisabeth Jacquet was one of the most talented, well-known, prolific and versatile women composers of her day. She was the first French woman to write an opera, invented the opera-ballet, published several collections of sacred and secular cantatas, and wrote a large amount of instrumental music for harpsichord, violin and other instruments. Click here for concert details. Elisabeth-Claude Jacquet was born in 1665 on the recently-developed Ile St Louis in Paris to a family of master masons, musicians and instrument makers. Her father was an organist (a profession later followed by Elisabeth’s two brothers), and gave Elisabeth her first music lessons. Her talent soon became clear, and at age five she made her first appearance singing and playing the harpsichord at the court of King Louis XIV. She made quite an impression, and became a regular visitor over the next few years. When she was about 14 she was accepted full-time into the royal court, where her education was supervised by the King’s mistress, Madame de Montespan. When the court completed its move to Versailles in 1682, Elisabeth remained in Paris, and two years later, aged nineteen, she married Marin de la Guerre, organist at the Sainte-Chapelle, which had one of the finest organs in France. Their son, apparently as precociously gifted as his mother, died at the age of ten. After her marriage, Elisabeth taught, and gave concerts at her home and throughout Paris, to great acclaim. The scholar Évrard Titon du Tillet later described her “marvellous facility for playing preludes and fantasies off the cuff. Sometimes she improvises … for a whole half hour with tunes and harmonies of great variety and in quite the best possible taste, quite charming her listeners”. Elisabeth had been composing for some time even before she married. Her first compositions were dramatic works, now lost. Her first surviving published work was Les pièces de clavessin, premier livre [Harpsichord pieces, book one], published in 1687 when she was 22. This was one of very few collections of harpsichord works published in France in the seventeenth century, and the suites are remarkable for their balanced structures, consisting of groups of dance movements, each preceded by an unmeasured Prelude (i.e. lacking precise indication of note lengths and rhythm) which therefore leaves a lot of rhythmic discretion to the performer. It is the first of these unmeasured Preludes that will be included in our concert. During the 1690s Jacquet de la Guerre composed the first ever opera-ballet Les Jeux à l’honneur de la Victoire [Games in Honour of the Victory] (the music of which is now lost), an opera Céphale et Procris, trio sonatas, and sonatas for violin and continuo. All of these works (and most of her later ones) were dedicated to Louis XIV, who remained a loyal admirer and patron. In 1704, after twenty years of marriage, Marin died. Elisabeth continued composing, publishing sonatas for the violin and harpsichord and several collections of Cantates over the next decade. Her principal supporter, the King, died in 1715, after which Elisabeth, now in her fifties, reduced her public appearances and appears to have composed less. Her last work was a Te Deum (also now lost) written in 1721 to celebrate the recovery of Louis XV from smallpox. Elizabeth died in the summer of 1729, aged 64, in the parish of Saint-Eustache, where she is buried. Her long and thorough will indicated that she was quite well off (and included the ‘large Flemish dual-manual harpsichord’ shown in what is probably the only known portrait of her, painted when she was in her thirties). Several of Jacquet de la Guerre’s known works are lost, and it is likely that there were many other compositions of which we are unaware, as well as the handful of surviving pieces. (Her nephews, who inherited the unpublished compositions, did not attempt to have them published, and they were not kept together.) She is remembered for her role in bringing to France some of the Italian genres of sonata and cantata, and for the variety, drama, rhythmic vigour and expressive harmony of her music. 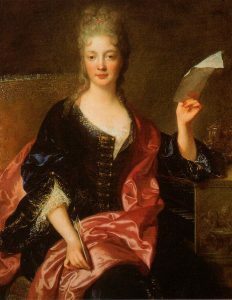 Although her life, like that of many Parisians of the time, was constrained by the conventions and whims of the Sun King and his court, Elisabeth Jacquet de la Guerre played her cards well to become the most successful female composer of the baroque period. She has attracted renewed interest since the 1990s, and there are now several recordings of her existing works – and, hopefully, several more yet to be discovered.